Mycroft Critter has been a constant companion since I was at school. He entertained me, said things I could never say, and he had a lifelong friend in Hydrant who was a source of wisdom, mystery and comedy. Sometimes he says things which might be considered outrageous, or at the very least controversial. Please believe me that he ridicules, questions, reflects, misunderstands, worries, lambasts and embarrasses people, organisations, races, religions, politics, celebrity and himself equally and without malice. No one is beyond satire or humour, and it’s not intended to do anything but amuse, or possibly prompt thought. If you believe you might be offended, please don’t read any further. 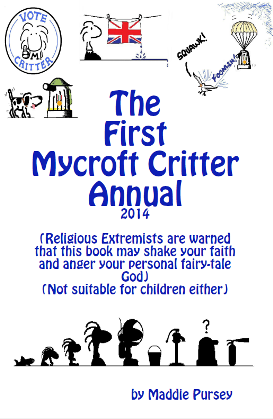 And please don’t think that these silly drawings represent the author or publishers’ views or opinions. They really, really don’t… …honest! 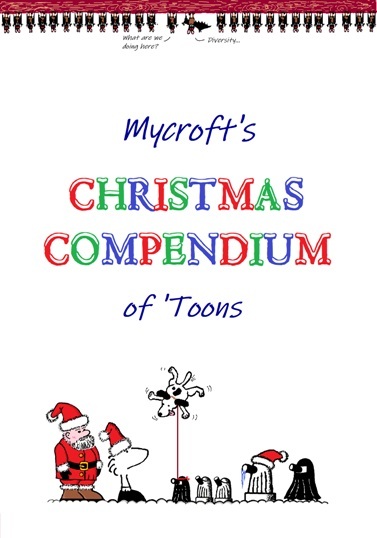 A Christmas Compendium of Mycroft, Hydrant and the gang of 'toons. Printed in full colour throughout, it's an art book which is a collection of Christmas 'toons from the last few years, and a few new ones too. Not really intended for youngsters, despite the appeal of the drawings, more for adults with a sense of fun. Those who already know the 'toons will know what to expect. Merry Christmas!